After enjoying a ham and brie sandwich from Bread, the local bakery in Durango, it was time to head back. Altitude is an issue for most visitors to this region. Drinking lots of water and taking it slowly your first few days is important. 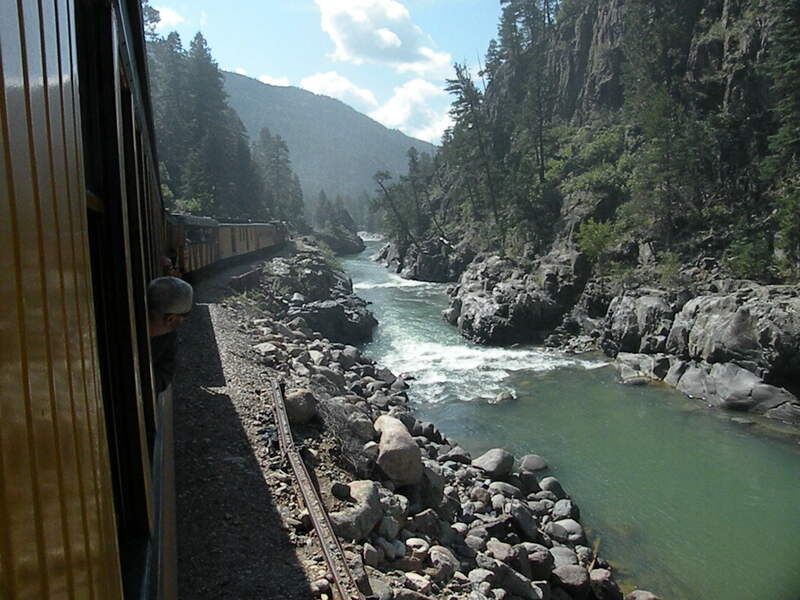 The train is an effortless way to get into the heart of the matter, but don\’t forget to be back in time to catch your ride home or you could spend a night where bears and wapiti (elk) roam. Back in Durango after a sumptuous repast at Seasons Restaurant, I drifted to sleep beneath the watchful eyes of Jimmy Stewart. 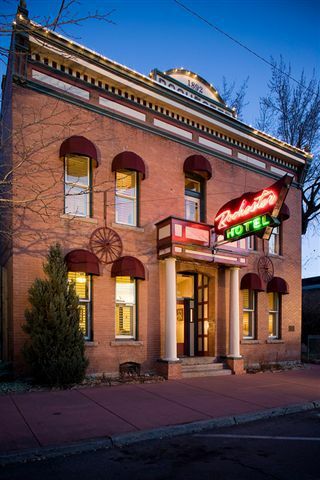 The rooms in the lovingly restored Rochester Hotel are lined with posters of western heroes like “The Duke” who stayed here while filming greats like The Searcher. After a complimentary country breakfast, I headed out of town on Highway 160 toward Mancos. In moments the world opened up to vast plains that spread to the base of pudgy sandstone buttes. A right turn onto Echo Basin Road brought me to Rimrock Outfitters. Lynn and Perry Lewis have been sharing their corner of the big blue sky overlooking Mesa Verde and the Sleeping Ute Mountain with dudes for twenty years. 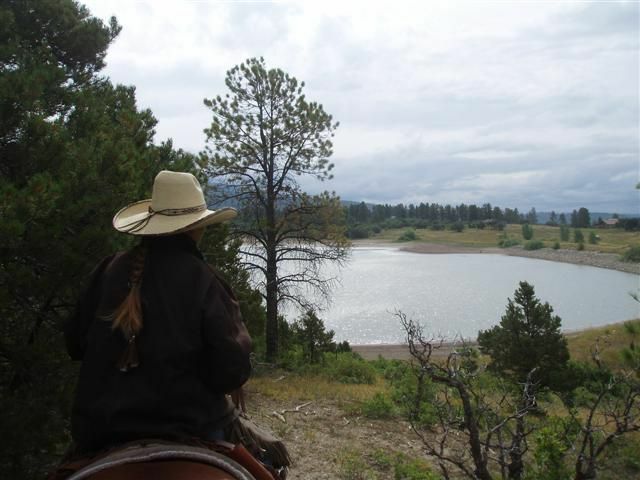 Rimrock offers a variety of rides on fit, well-mannered horses through lodge pole pines and mountain mahogany into meadows swathed in yellow rabbit brush brought to life by western author Louis L\’Amour, who called the La Plata Mountains home. If you are lucky, Lynn might get in the mood to yodel you a cowboy tune on your ride. I stopped at the Bakery in tiny Mancos for a home-cooked meal in a down home setting before catching the 1:00 PM tour of the elaborate maze of cliff dwellings at Mesa Verde. The entrance to the park is only six miles up the highway, but leave time for the fifteen mile serpentine climb to the Far View Lodge where you meet the bus. 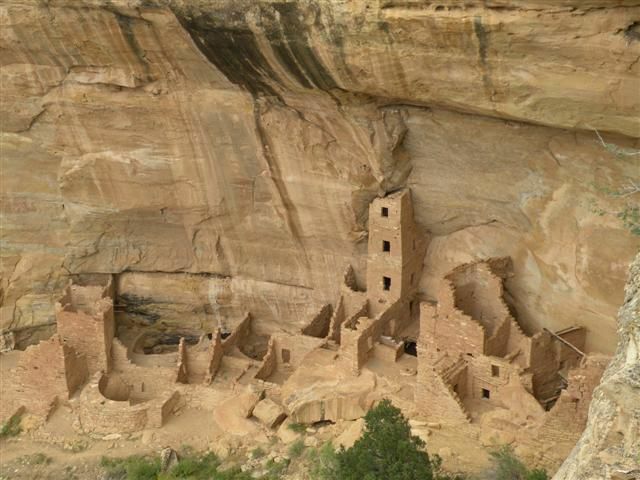 This tour provides an overview of the most incredible archeological site in North America. The ruins of the Pueblo peoples who lived here between 900 and 1250 AD are scattered throughout the vast mesa. These industrious peoples were farmers as well as craftsmen and masons. About 4,500 individuals lived here in the zenith of their time climbing rock walls like Spiderman carrying water in gourds to structures carved in the clefts of the canyon walls. Highly recommended is an overnight stay at the lodge in your own cozy cliff house overlooking the vast Colorado Plateau. Listen to the wind that whips the sage and piñon trees and watch the cloud play over the purple canyon country that stretches forever. Don\’t miss dinner at the Metate Room which features modern adaptations of dishes prepared with the nuts, herbs, and game used by the Pueblo peoples. Try the shrimp served with prickly pear jelly dip. Rise early and hike on the Petroglyph Trail behind the museum into the canyon and do the self-guided tour of the Spruce House. The stretch of the Skyway between Dolores and Telluride up the lush Dolores River corridor was once a route for the Ute Indians to their summer hunting grounds. It ascends to Lizard Head Pass past alluring Trout Lake to overlook three majestic 14,000-foot peaks that dominate the scene. 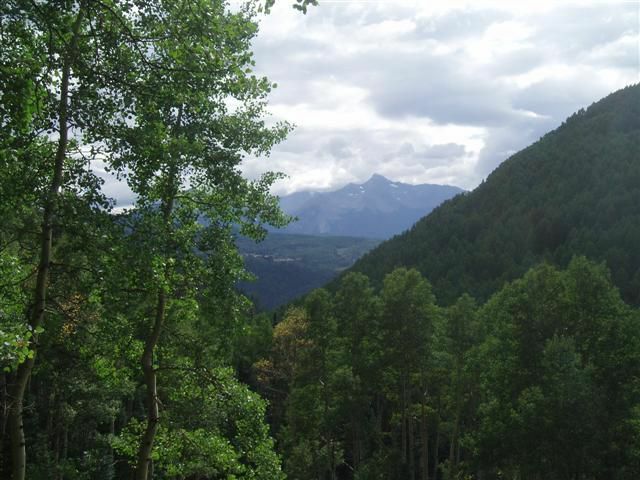 Drive beneath the craggy Ophir Peak then make a sharp descent into trendy Telluride where celebrity sightings are commonplace. Tucked into a box canyon, the town backs to Bridle Veil Falls spilling down a 2,400-foot headwall. The mountains surrounding the town are honeycombed with 300 miles of tunnels built by miners during the gold rush in the late 1800s through early 1920s. The Liberty Bell, Tomboy, Black Bear and others produced over $350 million in ore. Jeep tours to the Tomboy Mine perched in the basin overlooking the town is a popular half-day outing. Sensitive to me living at sea level, my Telluride hiking guide Josh, owner of San Juan Outdoor School, drove us up a rocky jeep trail to a trailhead overlooking San Miguel Mountain Park. The undulating Waterline Trail meanders through groves of aspen basking in celestial light, and forests of juniper and pine. Josh picked a few wild raspberries for me to try and pointed to the distant snow-crowned Mt. Wilson (14,000 ft) where he guides advanced climbers to the top. 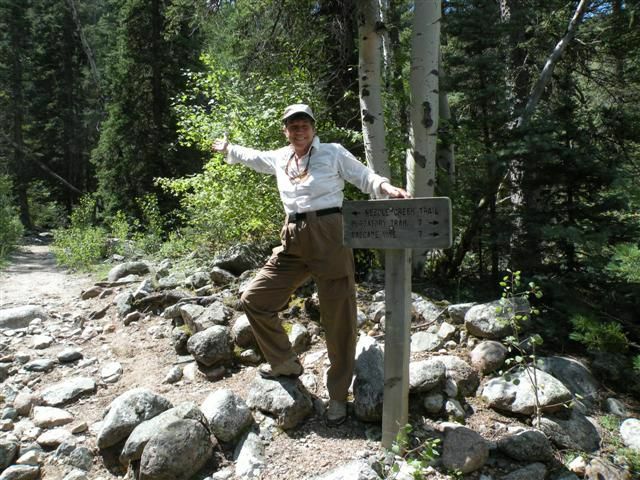 The trail deposited us near my lodging at the Aspen Street Inn located a block away from the gondola station where guests enjoy free lifts to Mountain Village and the trailhead to the River Walk-a delightful three-mile easy amble along the San Miguel River. The Inn is walking distance to a dozen eateries and shops on Colorado Street gussied up with twinkling lights and baskets bulging with flowers. Locals line up at La Cocina De Luz for fresh ingredients in spicy Southwestern burritos, tacos, and salads. Join me next month for more fun on one of the most scenic byways in America.